On May 17, 1968, two Roman Catholic priests with Syracuse ties entered Local Draft Board No. 33 in Catonsville, Maryland. There Rev. Daniel Berrigan, Rev. Philip Berrigan and seven others snatched Selective Service records, then burned them with homemade napalm to protest the Vietnam War. This action and the high-profile trial that followed brought Christian nonviolent resistance to the Vietnam War into the public consciousness and spurred heated debate about the role of clergy in anti-war efforts. Two children of Philip Berrigan and Liz McAllister (another member of the Catonsville Nine) who carry on their parents’ legacy and two activists who live out the Catholic social justice tradition will speak at the seventh annual Borgognoni Memorial Lecture on Monday, Oct. 22, at 7 p.m. “The Berrigan Brothers and the Catholic Social Justice Tradition in Syracuse” will take place in Maxwell Auditorium in Maxwell Hall. Admission is free. Parking is available at the Irving Avenue Garage and other locations on or near campus. The Berrigan brothers in a family photo. The program marks the 50th anniversary of the Catonsville Nine. 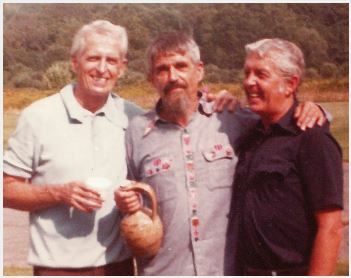 Dan Berrigan (1921-2016), a Jesuit priest; Phil Berrigan (1923-2002), a Josephite priest who later married; and Jerry Berrigan (1919-2015), a longtime Syracuse educator and social activist, “came to define the Catholic anti-war movement,” says Margaret Susan Thompson, chair of the Borgognoni Fund’s faculty steering committee. Thompson is based in the Maxwell School, where she serves as associate professor of history and political science and as a senior research scholar of the Campbell Public Affairs Institute. Throughout their lives, the Berrigans applied their Catholic faith to a broad social justice agenda, including civil rights and poverty. In the 1980s, they turned their attention to opposing nuclear weapons. The first Plowshares protest—a reference to the Biblical injunction to “beat their swords into plowshares”— took place in 1980, when the priest brothers and six others trespassed onto the General Electric nuclear missile facility in King of Prussia, Pennsylvania. There they damaged a nuclear warhead and poured blood on documents. The participants were charged, convicted and served federal prison time. Since 1980, more than 100 Plowshares demonstrations have taken place. The three activist brothers (raised in Syracuse with three more brothers) “from the very outset had commitments to Catholic social teaching,” Thompson says, referring to Catholic doctrine on matters of human dignity and the common good of society. The Borgognoni Lecture is made possible by the late Monsignor Charles L. Borgognoni (a.k.a. Father Charles), longtime Roman Catholic chaplain of the St. Thomas More Campus Ministry. Before his death in 2007, Borgognoni established a fund in memory of his parents, Joseph and Amelia, to promote the study of Catholic theology and religion in society at Syracuse. The Borgognoni Fund also relies on the generosity of friends and alumni, including Judith Pistaki Zelisko ’72, a member of the College of Arts and Sciences’ Board of Visitors, and Charles Borgognoni ’76, nephew of Father Charles, both of whom spearheaded fundraising efforts. For more information about the Borgognoni Fund or to contribute, contact Christopher Lukowski at 315.443.0354 or clukowsk@syr.edu.